Kathleen Mullen Clark is our June girl. Kathleen has been working for us since 1997 when she was hired as our first dyer. We met Kathleen first as a customer and fan of knitting, textiles and Mountain Colors. She started her employment amid a flurry of getting her house and seven children settled for her two days a week stint. Katie, Elizabeth, Margaret, Michael, Mary Frances, Patrick and Tommy were all enthusiastic about Mom starting to work at the yarn place. As with all the Mountain Colors kids they soon became a part of our life too. The kids were happy that they could drop in whenever they wanted and sometimes brought their school work to do in the dye room. If you asked them at that time what their favorite part of Mom working was they would unanimously say the M&M’s at her work. Kathleen grew up in the San Joaquin valley outside Bakersfield, CA. She graduated from High School and wanted to explore her Irish roots so she spent a semester in Ireland attending college and touring the country. During her time in Europe she was also able to explore Wales, England and Belgium. She loved Ireland the most and the rich history and beauty of the land. She came home and started working on an art history and nursing degree at various colleges in southern and central California. She finished school, started working at the local hospital and met Mike Clark. He was a friend of her boyfriend and attended a surprise birthday party for Kathleen. Mike bided his time and had the chance to ask Kathleen on a date two years later. After a brief courtship they married and Mike and Kathleen decided they would prefer a smaller community. Mike was born in Miles City, MT but his parents were living in the Bitterroot Valley. Kathleen and Mike loved the area and decided to move here. The family moved into a large older house in Stevensville and made it their own cozy, lovely home. Kathleen worked in the dye room for five years and then moved into our shipping area. She holds the record easily on packages beautifully packed and shipped in a single day. Kathleen always gets the job done. We sometimes still drag her into the dye room when we can. When asked what the favorite part of her job is, she said “Mountain Colors always allowed me to be available to my kids and I get yarn whenever I want!" Kathleen’s best memory of Mountain Colors is when a mouse ran across the dye room. She said “Diana’s scream was so loud and piercing that my entire central nervous system almost shut down. I told my family that night at dinner to much laughter – I still laugh about that.” It should be noted that the next day 8 year old Mary Frances quietly told Diana that if it would help she could bring her cat into the dye room. Life now for Kathleen is filled with her adult children and foster son Wayne living, working and some going to school in MT, CO, WA, and Australia. She has great joy in her life – and lots of photos - from her 4 grandchildren. She says all of her kids turned out so well despite a crazy mom – who occasionally becomes violent around computers! However, Kathleen thinks there should be a fine tune button on some of her children. You will most often find Kathleen knitting something at lunch time for one of her many recipients. Sometimes she even guiltily says she’s making a scarf for herself this time! Her favorite things to make are scarves and small kid sweaters and she also enjoys felted projects and interesting yarn textures and colors. Kathleen’s other great love is roses. 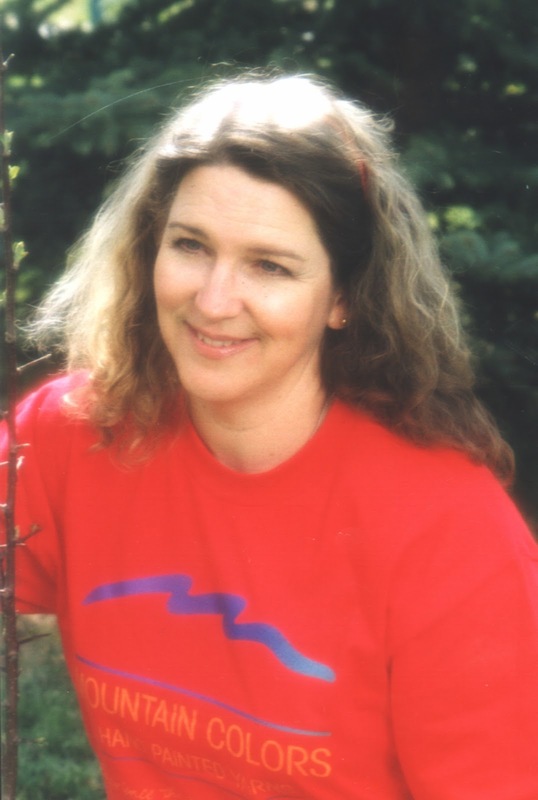 She is president of the Missoula Rose Society and she herself has 58 rose bushes in her yard. She said she is partial to hybrids, old English garden varieties, miniatures, floribunda and climbing types. She is used to cooking for a large family so she adds a well tended vegetable garden to her list of favorite things. She continues to have lots of people at the table each night whether they are her family or someone who might need a good dinner. When she finds a little quiet time each day Kathleen will have her nose in a well worn book. She counts her books as one of her greatest treasures. Our Kathleen, who has the very soul of an Irish lass, is the resident storyteller of all who work at Mountain Colors. She said of her life that she has been so blessed. Life would be dull without you Kathleen. We are the grateful ones to count you as a friend. Kathleen loves red so her favorite colorway is Ruby River (she says of course). She also loves Alpine, Harmony Starlight, Portland Rose, Harmony Moss and now discontinued Grass Valley Green.